All-inclusively gorgeous and green, this Stephen Amell Season 5 Jacket is a great outfit when it comes to its high quality PU construction. Impressive expertise could be seen all around on this exclusive Arrow Series garment whilst being invested with excellent elements to make it another topnotch bargain. Though, it make feel like a shielded luxury decorated with stud inputs up front along with pelt pieces, but on the inside a viscose lining keeps it composed and convenient. You are going to look cleverly dashing with this Stephen Arrow Jacket that is made while keeping the outfits originality in mind. 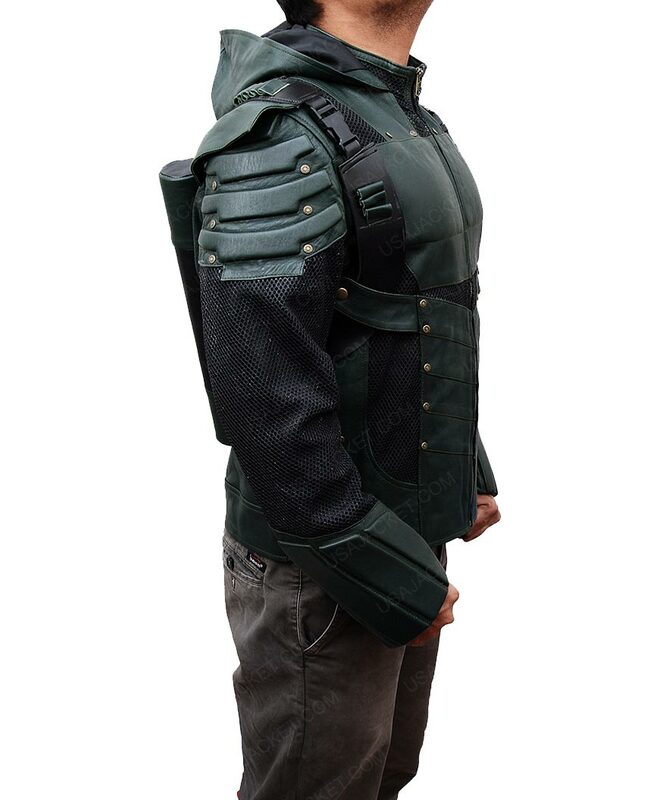 A few elements that are definitely the focus provisions of this Arrow hero garb guise includes a readily moving Zipper, web panels on shoulders including belt clip fastenings. 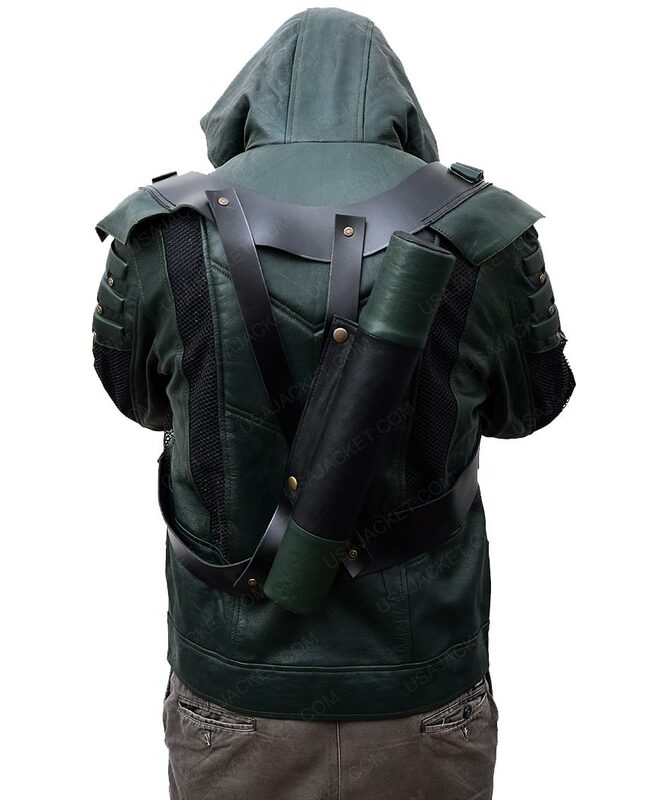 Nonetheless, you’ll also acclaim yourself a first-rate manufactured quiver as well to assemble a few arrows with yourself while dressing up as Stephen Amell with this intricately brilliant Green Arrow Season 5 Jacket. An authentic brand awaits your grab offering you a 100% authenticated swift suit factor. Special effects intrigued. 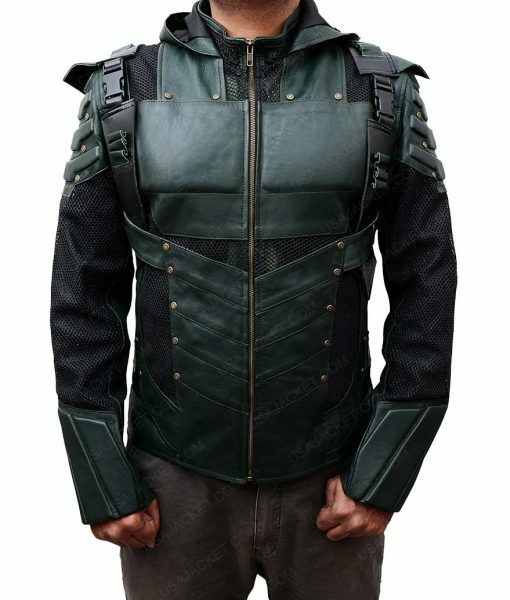 *TRIGGERED* That what made me really go for this garment as it’s so deftly enthused with accurate peripheries as amended on original Oliver Queen’s outfit. I had an issue for the cuffs padded extras that I’d email them for its removal – keeping it neat and clean. Otherwise, the whole jacket is spectacular with an amazing feel to it. Leather Quality is great and I had no bargaining issues with such an amazing price already. Looks so armory for the body and it felt not that much heavy (evenly balanced with facets and weight). I was knocked down with such an accurate attire presence in my room when I opened the box. Everything is so real and authentic. Cover after cover. Class on class. That’s what I received a few days back. Though I have might exaggerated a bit my first statement but what can I do as it’s formation has given me chills. The factor that I ignored for a moment was that it was a fair plotted PU synthetic leather. Gosh it’s so fine looking that it looks surreal real. Dang! Answered by the admin	This jacket is in faux leather. We have added a variation for you to choose either you want it in genuine leather or faux leather.